Light Tumbled 3.2 Cm Pavers 6x12 is a classic set of rectangular-cut tiles that have been placed in a brick pattern. They come in white with a variety of natural veining in brown and grey. The tiles are also textured and have a matte finish. The tile’s surface is uneven for that natural antiqued-look. 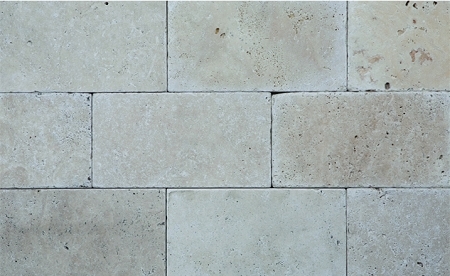 Light Tumbled 3.2 Cm Pavers 6x12 is made from travertine stone which is highly durable and tough. It can withstand a lot of wear and pressure. Its unique natural beauty is sought after because no two sets are alike, which makes the rustic appearance more authentic and appealing. Easy to install and work with. Light Tumbled 3.2 Cm Pavers 6x12 is perfect to apply on outdoor large areas. This is great as parts of a pathway, entrance, driveway or backyard. It can offer warm and inviting feel because of its sandy or rustic tones.